When the management of Northampton’s Thornes Marketplace wanted fresh, unedited perspectives on how people interact with the Thornes environment, they found them at Greenfield Community College. At GCC, students don’t just read about the principles of marketing, they put those principles to work advising real clients on business challenges they currently face. 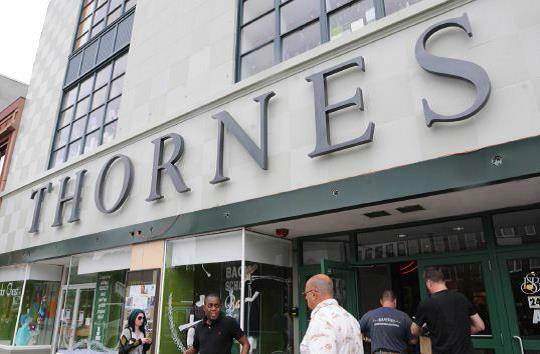 Fifteen students in Tina Stevens’ Principles of Marketing course chose Thornes as their client. Stevens is an adjunct faculty member and the owner of Stevens 470 Marketing & Creative. The marketing students ranged in age from 16 to 60+ and while some had no business background, others own businesses. Students took concepts they learned in class and used them to solve the problem posed by their client. They conducted client research and marketing analysis and then developed creative strategies that included specific recommendations. What did the Thornes team learn from the GCC students? What did the GCC students learn from working with Thornes? How does working with real clients enhance GCC’s curriculum? The Principles of Marketing class and the students’ work with real clients exemplifies how GCC’s Business & Information Technology department offers educational programs that provide current information and teach relevant skills students can put to use for an employer or in their own business. Each semester the class works with a local business. Previous clients have included Josh Simpson Contemporary Glass, Hillside Organic Pizza, Wings Over Amherst, The Greenfield Business Association, Amherst Brewing Company, Real Pickles, and The Bridal Barn. To learn more about the project and Greenfield Community College’s Business courses, contact Tina Stevens at 413.775-1752 or stevens@gcc.mass.edu or Kathy Vranos, Dean, BIT, Professional Studies, Social Sciences, 413-775.1471, vranosk@gcc.mass.edu.